E-Government’s effectiveness depends not on the technological supremacy of government but on how encompassing it is to reach the maximum number of citizens at the grass roots level. This requires a greater appreciation and understanding of inter-organizational and institutional factors beyond technology and human skills that shape the relationship between the government and its citizenry. Using the context of Bangladesh, the chapter highlights the promises of E-Government reform in Bangladesh with the caveat that whether at the agency level or individual level, E-Government focus should be from the ground up. Bureaucratic inertia is more prominent at the lower level of agency hierarchy than at the top. Given the successes of social entrepreneurship via civil society organizations (CSOs) in Bangladesh, the study suggests governmental partnerships with CSOs in providing E-Government services. As one of the primary communication devices of the 21st century, mobile phones offer a clear advantage to computers in bringing government to citizen’s finger tips. In recent years, among all types of governmental reform measures, E-Government has been in the top of the list since the publication of the National Performance Review (Office of the Vice President, 1993) published during the Clinton Administration. The attraction has been due to a culmination of factors including the rise of the Internet and popular belief that government is in the business of satisfying customer demands in the most cost efficient and timely manner. Just as with the Internet revolution, E-Government promised to become the modern-day tool for public managers in bringing government to the doorsteps of citizens. The initial buzz that began almost sixteen years ago is now seen in the ubiquitous presence of government websites at all levels in the United States and across the globe. The United Nations and World Bank have made E-Government development a priority for developing countries with the hope that it will make governments more transparent and public managers more responsive to citizen demands. More importantly, it is seen as an empowering tool that will transform government and liberate the marginalized groups who normally are unable to participate in direct democracy. 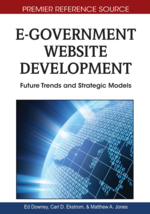 Despite the promises, there is little evidence to suggest E-Government has lived up to them, or has followed a path of progression that could lead to transformation of governmental service delivery (David Coursey and Donald Norris, 2008; Wescott, 2001). Rather, as envisioned about technology in general (Danziger and Anderson, 2002; Kraemer, Dutton and Northrup, 1981), E-Government has taken the incremental approach -- technological adoption has been slow, having only limited impact on the quantity and quality of services in routine governmental operations. Instead of transforming the way government interacts with citizens on a daily basis, E-Government adds to traditional government service delivery creating another layer catered to a smaller group of citizens. The beneficiaries have been limited to those who are privileged in society, particularly individuals and public agencies that can afford and have access to technology. Large segments of society are unable to penetrate this new layer of service delivery method or benefit from it due to various reasons including lack of operational knowledge (of its benefits) and lack of resources required to access them. The issue becomes far more complex in developing countries where bureaucratic practices and rules and customs add to the existing socioeconomic barriers (Yang & Rho, 2007). More often than not the barriers are overshadowed by the optimism espoused by E-Government enthusiasts. Given the limitations of technology and the unequal distribution of information, understanding of E-Government applications for all populations is in order. E-Government’s success can be measured by the tool’s effectiveness in motivating marginalized groups to participate in governance leading to improvement in their quality of life. This requires a greater appreciation and understanding of the socio-cultural situation beyond technology, and the sheer reality that technology cannot feed the hungry or clothe the needy.